The only exchange system than can exist in peak energy and post peak to me is barter. You are making assumptions that money is neutral which it is not, especially when it has no intrinsic value, people will revert to grain based money or something like it. There's no denying that barter is interesting and has its place. Large companies and countries use it, and the Internet has provided an added stimulus, with ebay-like websites that allow people to barter long distance. I have a hippy friend in Colorado who likes the barter lifestyle, and pays rent by refurbishing the houses he lives in. He likes it because he can dodge taxes and stay off the government's radar screen. Malthus, however, isn't talking about a pluralistic monetary culture, where barter is a complement to the fiat money system. He is referring to a society which has banished the evil pied piper of "funny money" for good. Could such a society really exist? Even if society collapses to such a degree that barter is necessary, society cannot keep collapsing forever, and thus will restabilize at some point. When stability is reached, people must conserve energy and increase their efficiency, so they will streamline the barter system by adopting a more divisible convenient money surrogate like gold (which is better than grain because it doesn't degrade, and thus is closer to abstract money). Once the switch to gold is made, the logic which drove our ancestors to create fiat money will drive the same change again. Gold will lead to fiat money by the usual route. That transition itself will be partly driven by the need to conserve energy. Hauling gold (or any commodity) around to do transactions requires real physical work. Imagine a whole country going shopping every day with a cow or grain or gold currency. Just one day of that would require a huge, wasteful, unnecessary expenditure of muscular energy. People will tire quickly of having to "lug" their money around. The last thing you would want to do in an energy poor world is buy big-ticket items with "grain money". You know, like: "Hey man, I brought your money over. It's parked out front in that convoy of horse drawn wagons." No, it's much easier to just deposit the grain or the gold in a storehouse somewhere, and exchange the receipt, or the deed. And there you go: fiat debt money is back in business. "No, it's much easier to just deposit the grain or the gold in a storehouse somewhere, and exchange the receipt, or the deed. And there you go: fiat debt money is back in business." JD, that is not a fiat money system. The receipt/deed is backed up by the stored gain. Also it should not suffer from inflation, as if you decided to take the grain or gold recipt a year later, you'll get the full amount, instead of a reduction of -5%. Gold is the best form of money, you do not have to carry gold around with you, you can have gold certificates that can entitle the bearer to a specific amount of gold per certificate. Now our current money system, you can not take a $100 bill and hand it to the federal reserve and ask for them to give you what it's worth, as there is nothing backing the money, only faith that the government will continue to support the currency. Barter has to be one of the most unfair systems of all time. Worth is based on nothing more than whim. How is it measured? I'll give you a cow if you give me that Radiohead Album. You give me a pound of rice, if you give me that signed photo of Sting. I'll swap next door's cat if you give me tickets to the next ASPO meeting. No wonder ancient civilisations tried to change the system at the first chance - if the whole world was run by Ebay we'd be swapping food to keep us alive for slaves, and anything we could get our hands on. "...as there is nothing backing the money, only faith that the government will continue to support the currency." But isn't the same true of gold? Gold isn't very useful. Gold, like a dollar bill, works as money if and only if all involved believe it does. "But isn't the same true of gold? Gold isn't very useful. Gold, like a dollar bill, works as money if and only if all involved believe it does." Your correct to a point, but dollar bills are nothing, gold is something. You mentioned Gold has no uses, well then neither does paper money. Gold will allways have *some* value no matter what, wereas fiat currency becomes worthless without government support. I remember a currency recently (I forget where)that the currency became so debased, that it was cheaper to use the money as toilet paper than to buy toilet paper with the money. JD, that is not a fiat money system. A gold storehouse with receipts always leads to fractional reserve banking. The banker will promise to back your gold. He will exchange $100 in gold for your receipt on demand, and since people rarely come to claim their gold, he will circulate more receipts than he has gold on hand. He does this because otherwise he can't pay you interest. If you want a "bank" which keeps your gold in a little box with your name on it, and doesn't loan it to anyone else, you will have to pay for it. I agree with JD when he says that any sort of banking system will lead to fractional reserve banking. Nobody wants to pay a premium to keep their money in a convienient form. So, either the merchant who accepts the currency has to pay (sort of like how CC transactions work right now), or the customer has to pay (far more likely) -- unless you are willing to accept the fact that your deposits might not be there when you come back. As much as the idea of a currency based on some fixed thing (such as gold) really apealled to me after I read about the idea, in reality, it just doesn't work out. They hate and ridicule economists, and believe them to be preachers of a false religion. I am not a doomer (or catastrophian, the term I prefer), and I think the free market is a useful and powerful tool. Nevertheless, it does seem like many economists have their head shoved so far into their theory that they can no longer see the light of basic common sense. They believe this, where the reality is this. That level of disconnect is, IMO, throughly worthy of ridicule. "That level of disconnect is, IMO, throughly worthy of ridicule." That would be true, if economists really believed that. They don't. Economists believe money is a medium of exchange, not a source of wealth. 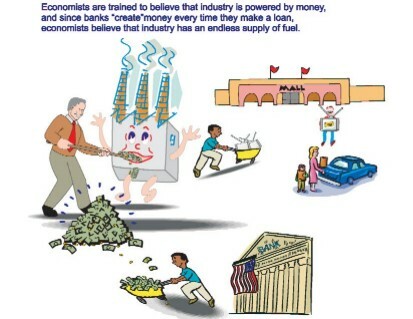 No economist believes industry is fueled by money. "Barter has to be one of the most unfair systems of all time. Worth is based on nothing more than whim. How is it measured?" In addition to Dukat's response to anonymous: Gold is more useful than paper currency, but it has no intrinsic value. Any currency requires the faith of the people who use it. Precious metals are more stable than fiat currencies, which leads to the stability of the faith in the people, which reinforces the stability of precious metal currencies. "Imagine a whole country going shopping every day with a cow or grain or gold currency. ... 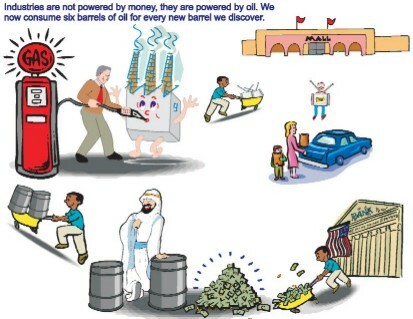 The last thing you would want to do in an energy poor world is buy big-ticket items with 'grain money'." Look, it's a straw man (attacking gold by attacking "grain money")! First, if an apocalyptic post-peak scenario happens, consumerism is going to be the one of the first things to go. Second, big ticket purchases aren't that common and definitely won't be after such a scenario. People aren't going to play hot potato with real estate or stocks like now. And I doubt people are going to be buying scads of cars and high-priced electronics like plasma screens. It's not going to kill anyone or the system if someone has to carry a few pounds of gold for a rare large transaction (like a house). But most of all, it's not that much more effort to carry around precious metals than paper or plastic currency. That's one of the reasons why precious metals are the best currencies: they can represent a lot of wealth in a small amount of material. Only fools will give up their freedom for that tiny convenience. That's one of the reasons why precious metals are the best currencies: they can represent a lot of wealth in a small amount of material. Digital currencies are even better from that standpoint. They represent a lot of wealth with no material at all. The bulk of gold is only one of its disadvantages. Another issue is security. Where is everyone going to keep their gold? On their person? At home? That's a thieves paradise. Gold is especially good to steal because it is easily laundered and untraceable. Of course, people could keep their gold in a rental vault, but then they will have to pay for that service, so they will prefer a bank, which creates fiat money and pays interest. And how about the issue of authenticity? How does the layman know that the "gold" he accepts as payment is actually gold? Maybe its been adulterated. Of course, you could have the government mint gold coins to solve that problem, but then you have other chronic problems, like coin sweating, shaving and debasement. Futhermore, if you need the government to stand behind the gold coinage, that defeats the whole purpose of getting away from government backed money. Governments can, and frequently have, sparked inflationary episodes by debasing precious metal coinage. Gold coins are "funny money" too. Our current monetary system is not perfect, but it supplanted gold for numerous rational reasons which goldbugs like yourself tend to gloss over. Following the debate I have noticed two primary problems with economists and PO. They have a problem comprehending the concept of eroei. They talk about GDP as if all the parts that make up GDP are equal. Barter is terribly inefficient due to the need to divide larger assets (cows for example). Gold based systems are hard to inflate, but also don't allow monetary expansion to help offset recessions. Economists do not think money powers fatories (see lorax link). Economics is the study of trade offs between differing choices. Finance is often confused with economics. I'd rather trade my paper dollar to the butcher, baker or electric utility for services, than to the government for gold (which has a historically poor return). You do not take into account that most local money systems are not based on barter but a local exhange unit. It can be a paper note or credit in a LETS system. They have grown from below 100 systems in 1980 to over 4000 systems in 2004.
anyhow is a sad statement on the quality of content in this site. I am fairly new to this money debate but reading this thread shows me how much confusion there is over a very simple issue. If one would study some history one would quickly learn that debt free money systems have been used many times, and several times since the Colonies started. With a general lack of English money, gold or silver the Colonies printed and successfully used "Colonial Script". This was a debt free money, ie issued by the government and no interest charged. Andrew Jackson was determined to issue a debt free money and free the country from the Central Bankers...and he did. Abraham Lincoln, struggling to finance the Civil War printed and issued debt free Greenbacks, and I believe this got him shot. (Jackson's assassination attempt failed, he would roll over in his grave if he could see his picture on a Federal Reserve Note.) There is no magic to a debt free money supply and it has nothing to do with gold, although gold is very desirable to own. All it takes is balls, a enough common sense to properly regulate the volume and a determination to see it through. Probably won't happen under Hillary or Obama. (Or Romney or McCain for that matter...Check out Ron Paul). The more I think about our current economic system the more I understand it is doomed to fail due to interest. When you really consider money you come to the conclusion that it's value is not exactly our faith in it that gives it value but the faith that it can obe exchanged for a product. A product we as a society make. The banks do not make the products so why are they getting a percentage of every single product we make and ever single service we provide. If the interest was removed from banks we would all get that extra percentage for the work we do the bank does not produce these goods why are we paying them for something we make. Another way to put this is that we produce 10 billion dollars worth of products and the bank buys it of us for 5% less than it is worth and this happens for everything we make. Then within that system we have 10 billion dollars worth of goods but only 9.5 million dollars worth of purchasing power to buy it back from the bank so we have to either borrow 500 million or lay people off because we are overproducing. The banks walk away with 5% of everything we make though. All the imbalances inflation/deflation unemployment due to overproduction are due to interest and would all disappear if interest was removed. These imbalances are easily hidden when our overproduction is sold to another country which gives us the difference to pay for 500 million interest. But causes that country to suffer since they are paying our interest and going deeper into debt themselves until they live like all 3rd world citizens do. This is also the reason why we have to continually work longer hours every year for the same quality of life. Our planet is a closed system like an island. Now if I were on an island and lent someone a $100 and charged him %5 interest at the end of the year he would not have enough money to pay me back. Some people say but my property would be worth more but the banks interest is always above the average inflation rate. So say inflation was %2 I could refinance at $102 but I would still owe $105. I would have to borrow the difference and pay compounded interest on it forever. This is one of the most important problems on our entire planet this is not just a little bit of money it compounds upon itself forever. If you will take the time to understand what I am saying here you will realize how important this is and I implore you to let people know. The only way we will ever stop all the suffering that is caused by this is by spreading the word. This is also the no.1 cause of wars as we try to balance our deficit and pay the interest.